Stock, 13-1/2’ x 7-1/2”, issued to Simon Freisman, February 12, 1902, VG. At each of its four corners are pictures in lithographic print of scenes from the Land of Israel: the Western Wall, a farmer in the field, workers in a weaving factory, and port workers. On the rear side are instructions for filling it out in three languages - English, Russian and German. 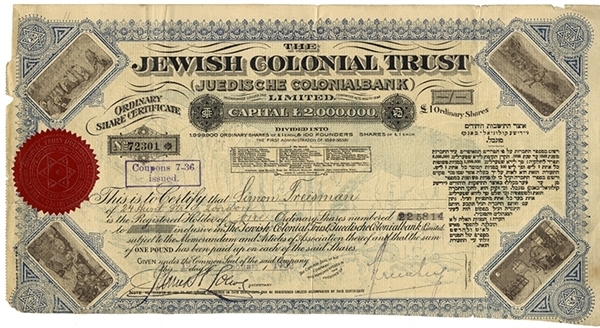 'The Jewish Colonial Trust' was founded at the First Zionist Congress in Basel by Herzl as part of the founding of a "Hebrew bank" whose purpose was to assist in the settlement of the Jews in Argentina, and later in the Land of Israel. With the sum the company raised a bank business was opened in London, whose important investment was the establishment of the Anglo-Palestine company in 1902. The company's shares underwent various transformations and changes of ownership. In the 21st century, the company was taken over by the World Zionist Federation.